My name is Aravindan. I am fundraising for my really good friend. 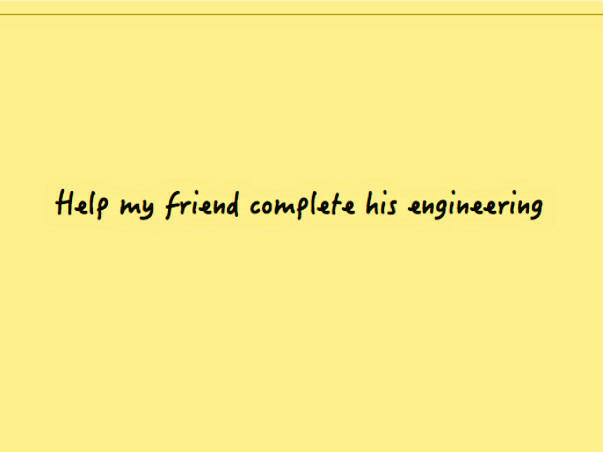 He is pursuing engineering in Chennai. He cleared his first year with good scores. 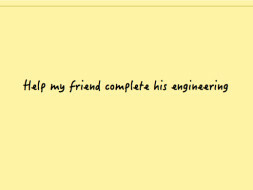 However, due financial constraints, he is unable to pay his 2nd year engineering fees. We have been able to collect 20,000 INR so far but are still in need of 60,000 INR. I am request each of you to come forward and support my dear friend. All funds raised will be transferred to the college account to maintain absolute transparency of the usage of funds. PS: To protect his identity, I have not shared any picture of him. However, I assure you once the fees are settled, I will be more than happy to share the receipts with the supporters over a email.